I knit a few Pookies in the Spring to give away as gifts, and also because I wanted to try out Knit Pick's Chroma worsted yarn for this toy. I thought if I worked from opposite ends of a ball, I could still get stripes, and make a bunch of toys that coordinate in a really fun way. It worked out super well, and only once did I have to skip a stripe in the ball of yarn so I could get different colours from each end. I tried the mid-winter colourway, having a little left from the Savannah Chaps, and the lollipop colourway, which turned out very bright! (Sorry, I don't have a photo of those, but will try to get one soon). To make it simple, you could use the Chroma yarn in the brown, grey, or natural colours to make the heads. For most of the toys* I used Sugar Bunny yarn to make the toys extra fuzzy, but it is a bit finer, and you can see the change in gauge if you look closely. Besides trying out a new yarn for this pattern, I also tried a new animal. Being Spring, I though I would try making a lamb! It's very easy to modify the pattern to make a lamb: you'll need a bit of felt, and be comfortable with hand-sewing, to make one like the lamb in the photo above. Also note that the hood won't fit if you sew the ears on this way, but it's still cute without the hood. To start, work the body and then the head up to Row 14, then turn the toy inside out so you can weave in the yarn ends. Turn the toy right side out. Next, cut an oval from paper, about the size you want the face. Try it on the toy's face, to see if you have the size and shape right. When you're happy with it, mark where you want the eyes. Use this as a pattern to cut the lamb's face from felt. Transfer the eye marks to the felt, and use sharp scissors to cut tiny slits for the safety eyes. Place it on the lamb's face, and pin in place. Insert the safety eyes, since they will help hold the felt while you sew it on. With hand-sewing needle and matching thread, sew the felt to the knitted face (a whip-stitch works well for this). Now you can stuff the toy, and finish the toy body as written in the pattern. To make the lamb's ears, knit the bunny ears from the pattern, with this alteration: once you reach Row 3, work only 3 rows of stockinette (instead of 6), and then work the decreases. To finish, sew the ears to the sides of the head, and embroider a nose and mouth. Embellish the finished toy as you like! 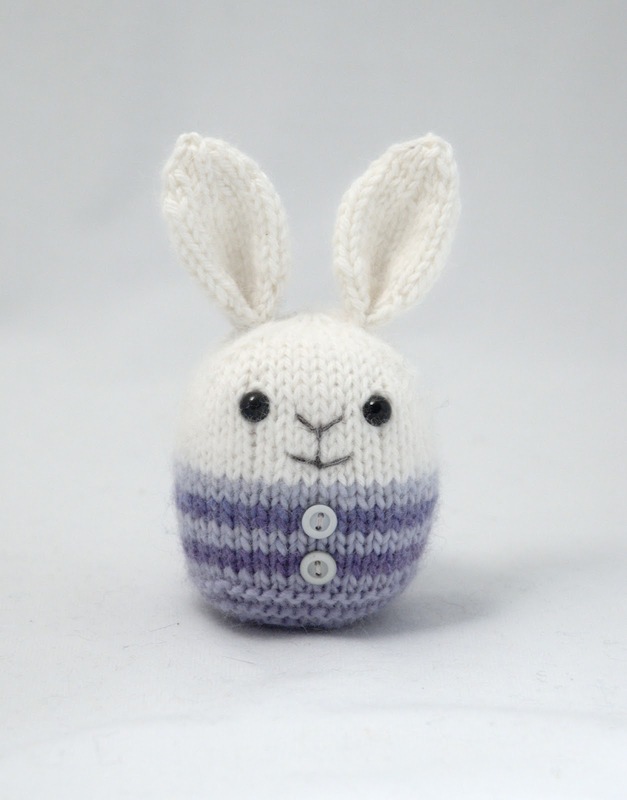 Here's a bunny I made from the Pookies pattern, using the last of the mid-winter colourway. 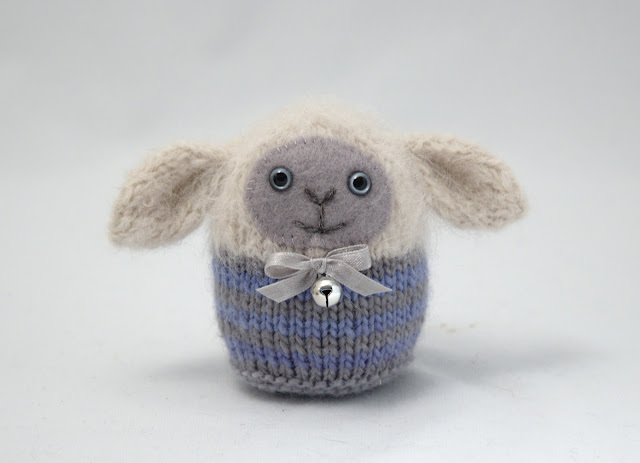 *For those interested, I used Knit Pick's Suri Dream for the lamb's fuzzy fleece - a discontinued and much missed yarn! As a substitute, I find a 100% alpaca yarn, especially single-ply, gives a similar soft, fuzzy look. Posted by Barbara Prime at 9:38 p.m.
Delightful. My pookies delighted me, too, and they weren't half as cunning. July 12, 2012 at 9:36 p.m.
That lamb with the little bow and bell is about the cutest thing ever! March 13, 2015 at 10:29 a.m.